I believe this was one of my first, if not the very first OPI I purchased as a teenager. I wanted to save it so I haven't done a mani with it in years. It smells sooooooooooo bad! I have thinned it many many times over the years. I'm not sure why I cling onto something so silly, but I know some of you can relate lol. This is 2 coats with SV topcoat. It's jelly-like but I think it's a creme. Or maybe an in between, a crelly! I don't know, now I'm pulling words out of thin air. I should just buy a backup bottle of this and be done with it, right? Greasy hair, sans makeup what to do? 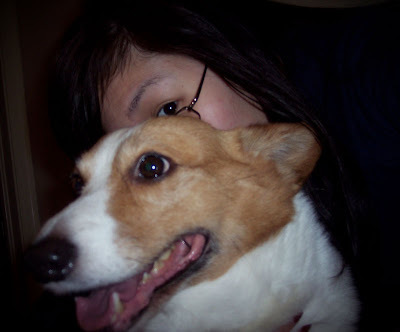 Put a cute corgi in front of you!